New beer books hit shelves every year, and I try to read as many as possible. They run the gamut: deep dives into specific beer styles, historical investigations, technical manuals for exacting homebrewers. If you bought every beer book you see online, you’d have a small library’s worth. But truthfully, the average beer fan doesn’t need all of them. Even if you’re more interested in beer than most, you can gain a wide understanding of beer from just a handful of books. Some of these might be considered “classics” of the genre, but they remain the foundation for thinking critically and curiously about beer. They won’t touch on every contemporary beer style (the late beer writer Michael Jackson could not have foreseen milkshake IPAs), but they don’t need to. If you read only these six books, you’d have a solid enough understanding of beer’s history, taxonomy, and ingredients to enjoy whatever style of beer brewers dream up next. 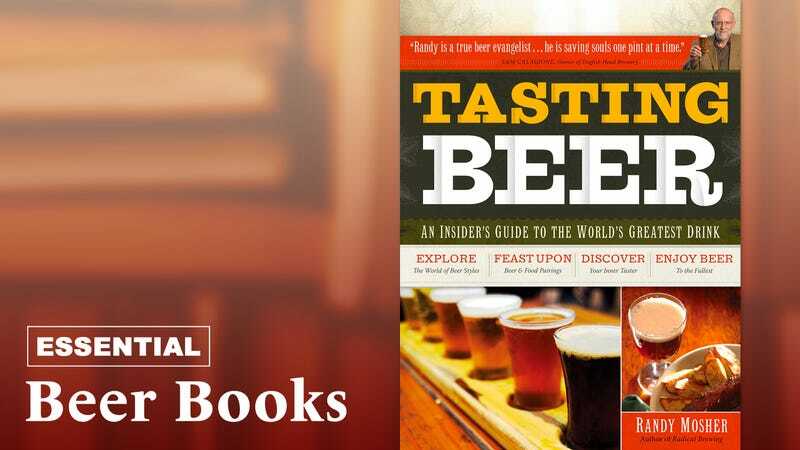 First published in 2009 (now with an updated second edition), this accessible book is a true one-stop shop: part history, part tasting manual, part beer-style guide. It remains the beer book I most recommend to newbies. Randy Mosher, a beer author and consultant, has a conversational tone that never gets too far into the weeds (when he presents technical, scientific information, for example, it’s usually in graph form so as not to bog down his text). If your goal is to better enjoy the sensory and cultural experience of drinking beer, this is required reading. Garrett Oliver is Brooklyn Brewery’s brewmaster, but he’s also a James Beard Award-winning author who’s played a major role in bringing beer to mainstream culinary consciousness. His beautiful 2011 encyclopedia, The Oxford Companion To Beer, collects more than a thousand alphabetized beer-related entries, from acetaldehyde to zymurgy, written by some of the most knowledgable minds in beer. When I’m loathe to sift through the questionably factual web search results for a beer term like decoction mashing, I go straight to this book. It’s become as indispensable to me as my regular dictionary. First of all: No, not that Michael Jackson. This Michael Jackson enjoys a legendary reputation of his own (in the beer world, at least), as he was one of the first authors to expose Americans to the vast, rich world of beer that existed beyond U.S. borders. First published in 1977 (as The World Guide To Beer, updated to a revised second edition called The New World Guide To Beer in 1991), this book hit shelves at a time when most Americans thought beer should be yellow, bubbly, cold, and cheap. But the book isn’t just a historical relic; beer aficionados will still discover new, foreign, and regionally specific styles they likely haven’t yet tried. If you already know your hops from your malts and your ales from your lagers but are looking for a structured challenge, Brooklyn-based beer writer Bernstein has your back. Written for the contemporary craft beer geek, this book is organized in to 12 “boot camp” chapters with specific beers suggested for tasting alongside each lesson. It’s the next best thing to signing up for an actual beer-tasting class: Read the chapter, crack open the recommended beers, and match Bernstein’s notes to your own perceptions. Even if I’m not drinking while reading, I still appreciate the snack-sized sidebars throughout the book, which offer brewery profiles, tips and tricks, and historical context. Jeff Alworth is one of my favorite contemporary beer writers—add his Beervana blog to your RSS reader, if you haven’t already—because he appreciates not just the liquid in your glass but why we like to drink it. His 2015 book, The Beer Bible, is a necessary addition to a beer library because it’s the rare reference book that gets at the culture of beer drinking, not just its nuts and bolts (though there’s plenty of nuts and bolts in there, too). I love that this book scratches away at the whyof beer: Why does British pub culture exist? Why did American craft brewing suddenly explode? Why are hops such a beer-geek obsession? Curious drinkers, this is for you. Speaking of how American craft beer exploded, this bookseeks to answer that very question in all its depth and complexity. Released in 2013 at the height of American craft beer’s surge, Acitelli’s meticulous accounting of the industry’s rise looks at the cultural, economic, and technological forces that enable scrappy upstart breweries to challenge the status quo. It’s full of archival material and interviews with key industry players, but I find it much more entertaining than many single-subject historical works. It is about beer, after all.